The new Electronic Control System developed by Magneti Marelli for the upcoming season of Moto2™ was presented today, during the Technical Press Conference organized by Dorna at Circuit Ricardo Tormo in Valencia to present the 2019 Moto2™ Project Development. From next year on, in fact, the Moto2™ class will witness a technical step forward with the adoption of a new engine, developed by Triumph, and the new electronic control system, which will be provided to all the teams competing in this class by Magneti Marelli. According to Dorna’s requests, the new system has been designed to fill, with a sensible approach, the technical gap between Moto3™, Moto2™ and MotoGP™, adding technical content to Moto2™, also with the consequence of improving the handling and the rider safety, and bringing them closer to the standards of MotoGP™. The main challenge in achieving these objectives arises from the need to develop a system which is capable of providing complex technological content, close to that already provided by Magneti Marelli for the premier-class, adapting it to Moto2™ vehicles in terms of compact size and affordable costs. 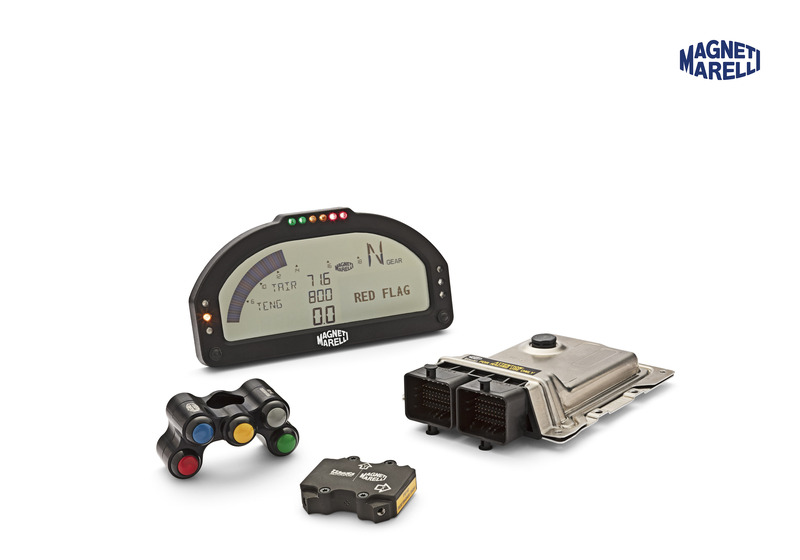 With this agreement, all the teams will have access to a complete kit including Engine Control Unit, Inertial Platform, Dashboard, Switch Panel and relative Software. In fact, Magneti Marelli will provide an integrated system, comprised of various components which individually perform a specific function, coordinated by the ECU, and which work together to ensure an harmonized and efficient management of the vehicle. This systemic approach of several components integrated allows, at the same time, for costs to be optimized. Training and continuous track assistance will be guaranteed by Magneti Marelli, in order to help the teams approach the new system. The Moto2™ electronic control system project involved 12 Magneti Marelli engineers, who worked for over one year in order to develop the hardware, basic software and application software, as well as to fine tune and calibrate the system. This also marks a new important step for Magneti Marelli in the collaboration with Dorna, together with the experience in MotoGP™, where the company is already supplying the unified Engine Control Unit to all the teams. The Engine Control Unit is a compact and powerful ‘all-in-one’ system, specifically designed to control motorbike engines, driving actuators, acquiring data through a data logger from the bike’s strategic sensors and process them through the dedicated software. It is designed to reduce complexity and weight, while providing technical added value. The main challenge consisted in integrating and adapting the high-end and complex technology developed for MotoGP™ to the different requirements of Moto2™, also focusing on size reduction and cost-optimization. The Inertial Platform System supplies to the Engine Control Unit all the relevant information about the bike’s behavior in space, like acceleration, rotation speed, lean angle, in order to manage its balance and grip in the best possible way. It hosts sensors (accelerometers and gyroscopes) that allow to reconstruct the bike’s status, maximizing, through the control of some actions, tyres behavior and performance. The system ensures reliability through a redundant architecture. The inertial platform introduced in Moto2™ will be the same as the one in MotoGP™. The Dashboard is a compact LCD panel, mounted on the bike cockpit, in the rider’s line of sight, which shows a wide range of information including some general data (engine revs, gear/lap number, lap time…etc. ), notifications about certain strategies (launch/traction/wheelie control…etc.) and messages from the Race Direction and the team (typically flags or race/competitors infos). The Switch Panel is a compact, ergonomic and customizable module, mounted on the left-hand side of the handlebar and allows the selection of different settings for base strategies (throttle management, engine brake, traction/wheelie control…etc. ), as well as the activation of other strategies (launch control, pit limiter…etc.). The Software provided for the Moto2™ championship comes from the Dorna MotoGP™ software, conveniently adapted by Magneti Marelli to best suit the middle-range series environment, through the simplification of some features. According to technical specifications agreed with Dorna and Triumph, the control strategies have been “base” pre calibrated, in order to guarantee engine reliability while ensuring riders and electronic engineers the most gradual entry in the new software. Nevertheless, a number of calibrations have been left available to the teams. For example: it will be possible to change fuel and advance calibration in a “restricted” range; the lambda control algorithm calibrations will not be accessible (as it will be pre-calibrated), but teams will have the possibility to enable or disable it. Similarly, for gear change management, base calibration of upshift/downshift algorithm will not be available, while the strength selection on the lever will be left to the teams, like as well the gear central band adjustment. Furthermore, it will not be possible to design the relationship between grip position and throttle opening, but it will be allowed to select pre-calibrated curves inside an internal ECU database. This is another significant achievement for Magneti Marelli in the motorsport field: throughout its 100-year history, the company has been supporting all the top teams in the most important world championships and competitions. Magneti Marelli Motorsport is currently supplying all Formula 1 teams with the Wi-fi telemetry system, Dorna with the Engine Control Unit for MotoGP™ and provides the telemetry system for Formula E.
Magneti Marelli designs and produces advanced systems and components for the automotive industry. With 85 production units, 15 R&D centers in 20 countries, approximately 44,000 employees and a turnover of 8.2.billion Euro in 2017, the group supplies all the major carmakers in Europe, North and South America and the Asia Pacific region. The business areas include Electronic Systems, Lighting, Powertrain, Suspension and Shock Absorbing Systems, Exhaust Systems, Aftermarket Parts & Services, Plastic Components and Modules, Motorsport. Magneti Marelli is part of FCA.